Shake once without ice and once with ice, strain into a coupe, and garnish with 10 drops of Angostura Bitters. Two Wednesdays ago, I took advantage of my night off by heading into the Downtown Crossing area. As a first stop, I paid a visit to Yvonne's Library Bar where I found a seat in front of bartender Sean Frederick. For a drink, I requested their variation of the Honey Bee; the classic recipe appeared in David Embury's The Fine Art of Mixing Drinks. Embury explained in the gin-based Bee's Knees that "the same drink, except for the use of white Cuban rum in place of the gin, is known as the Honeysuckle. The same drink with Jamaican rum is the Honey Bee." 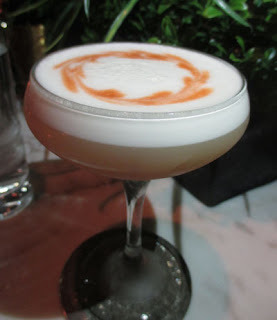 Here, the rum is Barbadian instead of Jamaican; moreover, pear brandy, egg white, and a bitters garnish round out the changes. This Honey Bee gave forth a clove and allspice aroma from the garnish sitting on the egg white froth. Next, a creamy lemon and honey sip led into a rum-driven swallow with a pleasant pear and spice (from the garnish) finish. Indeed, the pear eau de vie added a bit of complexity to replace the high ester content that would have been found in the classic's Jamaican rum. Sounds delicious, and I'd missed that Yvonne's was open, thanks!